FiveThirtyEight projects a national insight down to the local level. There’s evidence that Trump is underperforming Romney among Asiansand African-Americans, not just Latinos and college-educated whites. Clinton, on the other hand, has been underperforming President Obama among non-college-educated whites. Let’s call this scenario the “2016 Vote Swap.” In it, Clinton would win the election, and her share of the two-party vote would be 52.7 percent — 0.7 percentage points higher than Obama’s 2012 showing. However, we also estimate she would win 10 fewer electoral votes than Obama did in the Electoral College. The model suggests that several traditionally Republican suburban locales with diversifying and highly educated electorates could be poised to flip and support the Democratic presidential candidate: Orange County, California; Gwinnett County, Georgia; Chester County, Pennsylvania; Fort Bend County, Texas; and Virginia Beach. The model also suggests that Clinton could make major gains — while still falling short — in Douglas County outside of Denver; Hamilton County outside of Indianapolis; and Delaware County outside Columbus, Ohio. 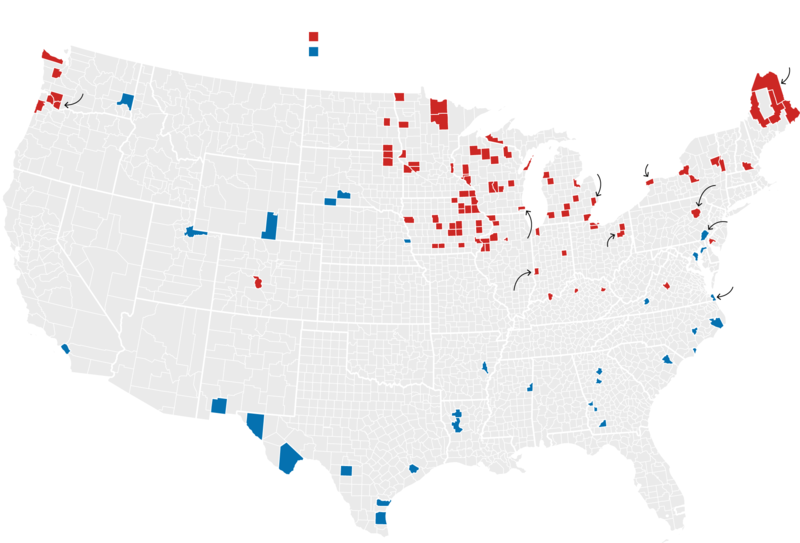 Needless to say, some of these counties are more consequential than others. Having Fort Bend go blue, which nearly happened in 2008, would if nothing else be a big psychological lift for Democrats, as it would represent the first beachhead outside the traditional big urban/border county box that the party has been in. If Fort Bend, then why not Williamson, or Collin, or whichever other suburban county? The other county worth keeping an eye on is Nueces, which is the population center for CD27, home of Rep. Blake “I was thrown off by the anchor’s use of a hypothetical question” Farenthold. That district could conceivably come into play if things get really bad for Trump; Lord knows Farenthold is incapable of being an asset to himself, so if there’s trouble he’ll be right there in it. We don’t have the the fuller Census data that the 538 crew uses to make these projections, so it’s impossible to say how much of a shift there might be if their hypothesis holds. There would be plenty of other factors affecting things as well, so don’t get too wrapped up in this. But if you’re in one of those counties, especially Fort Bend or Nueces, take this as motivation to do some GOTV work. The promise of a good result is there waiting to be taken. Juanita has more.